Sharps Containers Aren’t Just For Needles. What Else Goes In Sharps Container? Perhaps you saw the practitioner drop the needle into a sharps container if you had blood drawn or received a vaccination at a healthcare facility. These containers are crucial for infection prevention. They are rigid, puncture-proof, and have lids that seal securely to prevent the contents from spilling out. However sharps containers aren’t just for needles. “Sharps” is the medical definition for any sharp-pointed object that can cut or puncture the skin. What Else Is Going Into Sharps Container? Sharps have potential disease-carrying blood or other potentially infectious materials on them, they are talented of spreading disease. Executing a sharps safety program is the best defense against improperly using a sharps container. Institutions should look at their needle devices to determine safety and check how sharps are being handled and disposed of. Staff should remember to never use sharps containers as regular waste receptacles. Not only is this unsafe, it is also costly for waste generators, as the waste hauler must separate the waste. What is a sharps management program. It is a proactive service to help healthcare facilities advance environmental and employee safety. Don’t be ill-prepared! Contact us to discuss a tailored sharps waste management solution to suit your organization’s needs and budget! In accordance with the Centers for Disease Control and Prevention (CDC), around 385,000 needlesticks and related sharps injuries happen each year in the healthcare setting. Most sharps, especially needles, are designed to penetrate human skin and therefore often become contaminated with blood. Blood may contain various pathogens, such as hepatitis B virus, HIV and other dangerous substances. Your facility likely has a sharps management program. to prevent your medical personnel from contracting these diseases, But how effective is it ? Our Glycon LLC medial waste removal company provides sharps disposal services for numerous local hospitals, nursing homes and doctor’s offices. Here are a few tips to help you fine-tune your approach to sharps management and reduce the risk of needle-stick injuries among your employees. Needles and syringes, IV needles, Scalpel blades, Lancets, Insulin pens and other auto-injectors, Broken or fragile glass. Always remember that these items become regulated medical waste only when they are contaminated with blood, which is what most of them are used for. Glass vials, ampules, tubes and slides may also become sharp if they break. If they are contaminated with blood, they should also be treated as sharps and disposed of accordingly. Disposable vs. Reusable Sharps: Mainly, sharps used in medical facilities are the disposable kind. However, certain sharp items such as scalpels and similar tools may be reusable. While using reusable sharps in your facility, make sure they are collected in a separate container and are properly disinfected in an autoclave or through a different method. Sharps Collection: Disposable sharps, after having been used, should be immediately placed in a designated disposable sharps container. This lower the risk of a sharp item being dropped on the floor or coming in contact with another person. Sharps containers are specially designed for sharps management and feature a wide enough opening for large objects, as well as a built-in mechanism for unhooking needles. GLYCON LLC supplies sharps containers for both large and small-volume sharps generators. Only you decide where to place your sharps containers, but it’s best when they are always available at the point of waste generation. The least distance your staff has to cover to drop the sharps waste in a container, the better. Don’t throw sharps in the trash or in bio-hazard bags. Don’t bend needles and other thin sharp objects to try to make them fit into a container. Don’t overfill the sharps disposal container. Don’t try to recap a needle. Don’t pass a sharp object to another person unless absolutely necessary. If you tend to reduce the number of sharps-related injuries in your facility, one of the possible solutions is to reduce the number of sharps. This may sound silly at first, but when you use it may be possible to substitute a sharp tool with another tool that does the job equally well. For example, certain medications may be available to be administered orally instead of intravenously. Otherwise, a blunt-edge needle may be used instead of a sharp-edge needle. 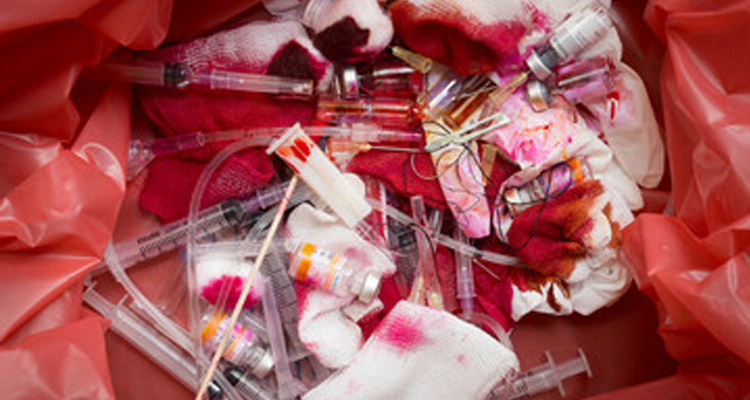 Do you want to find a reliable San Diego medical waste disposal service to take care of your sharps waste? Give us a call (844) 494-8222 and we’ll be happy to help! Regulations State That Healthcare Facilities Must Follow Specific Criteria When Choosing Sharps Containers. The best defense against sharps-related injury is implementing a sharps safety program. OSHA recommends that institutions look at their needle devices. It helps to determine safety and check how you handled and disposed of sharps. Part of this process includes choosing the right sharps container to keep sharps out of the trash and held in a safe receptacle prior to disposal. Sharps containers are regulated by the FDA as a Class II general hospital medical device through the authority of the Federal Food, Drug, and Cosmetic Act. There is a list of questions product evaluators should ask when selecting a sharps container that manufacturers should consider in the design process. These include puncture resistance, mounting systems, safety features, opening and closing mechanisms, safe transport, autoclaving capability, potential for spillage, ease of use, handling procedures, overfill protection, container access, container color and warning labels, and cost effectiveness. Outlining what is required for safe containment and accessibility the CDC also offers a “performance criteria” for sharps disposal containers. This factors includes visibility, accessibility, functionality, and accommodation. Aside from regulations, facilities should determine how quickly they will accumulate sharps waste, how many sharps areas they will require, or, if applicable, will they be mobile or fixed sharps containers? Working with a certified and responsible medical waste disposal company is an easy way to select the right sharps container. We can ensure your staff’s safety and your company’s regulatory compliance When you work with a company like ours you are working with a company who can help you manage all of your medical and pharmaceutical waste disposal needs, including purchasing the right sharps container for your facility. HOW DO YOU DISPOSE OF MEDICAL WASTE?